A public hearing was held Monday night at the Johnston County Courthouse in Smithfield to gather public comments on the proposed brunch bill. The measure would allow the sale of alcohol beverages beginning at 10:00am on Sunday’s instead of Noon. The measure was adopted in 2017 in many of the municipalities across Johnston County. Since that time, county administrators say they have received numerous requests from merchants in unincorporated areas of the County wanting the Ordinance considered. 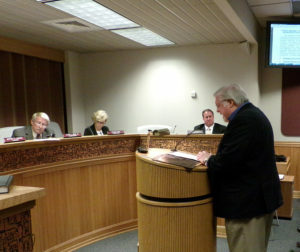 During the public hearing Monday night only one person spoke. Rev. Mark Creech, Executive Director of the Christian Action League and also a resident of Johnston County, said his organization was the primary opponent to Senate Bill 155, the Brunch Bill, in the General Assembly last year. Rev. Creech said studies show an increase in the hours of alcohol sales has a direct relationship to the number of accidents, highway fatalities, crime and social problems. “The opioid crisis pales in comparison to the cost of alcohol abuse and use,” Creech told commissioners. Creech said Sunday morning alcohol consumption would have a negative impact on churches. He said the bill may be sensitive to business interests but it comes at the expense of religious interests and fails to take into account the public health and safety concerns often overlooked by alcohol consumption. Rev. Creech told commissioners than increasing the density of alcohol availability leads to higher consumption levels and increased problems. By adopting the Brunch Bill, commissioners would be increasing alcohol-related problems in Johnston County, he said. Commissioners Larry Wood and Lee Jackson were not in attendance of the meeting. The 5 commissioners who were present for the public hearing agreed to postpone a vote on the Brunch Bill until all 7 members can be present to vote at their regularly scheduled August meeting. North Carolina is among 48 states that now allow alcohol to be sold before Noon on Sunday’s.